of privacy screen will help you save money but hide your property from view just as well as another privacy fencing solution. Whatever privacy fencing system you choose for your home or business, be sure that you’ve evaluated your options carefully so that you know you’ve made the right decision for you, based not only on functionality but on the look and price of your fencing system as well. No matter what privacy fence we install for you, you can look forward to noise reduction, additional shade, and greater protection for your property. A more traditional privacy fencing system, wooden privacy fences have been used for years by homeowners who want to shelter their homes from neighbors’ wandering eyes or even business owners who want a simple way to control access to restricted areas. Privacy fences have several uses other uses, though, and wooden privacy fences are perfect for any need. 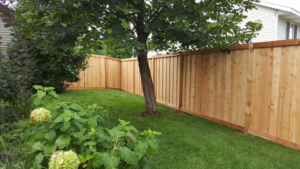 A wooden privacy fence allows you to create a definitive boundary around your property, enclose your yard to keep children and pets inside, and protect your property from intruders. Privacy fences are typically very tall, and a wooden privacy fence is generally difficult, if not impossible, to climb, making them secure from both sides. You’ll also find that wooden privacy fences are perfect for keeping noise out of your yard – as well as in – so that you aren’t disturbed by your neighbors and you don’t find yourself disturbing them! Wooden privacy fences also have the large advantage of being uniquely crafted, as wood is a material that can be used to create virtually any design, unlike vinyl or chain link privacy fences. With a wood privacy fence, you can choose from popular stockade wood fencing with a colonial design; lattice wood fencing to add a decorative design with measured airflow; solid board fencing, the most common and simple wooden privacy fence system; and shadowbox style fencing, which leaves space between fence rails to block vision but allow airflow. Vinyl fencing systems have become more popular recently, aesthetically complementing any modern homes. Like wooden privacy fences, PVC fencing systems are able to protect your home from peering eyes and unwanted guests, provide shade on sunny days, reduce noise pollution, and ensure that your children and pets stay safely inside your yard. 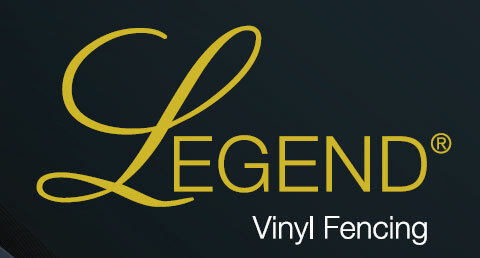 Vinyl privacy fences have the added advantage, though, of being slightly more durable than wooden fences. With a PVC privacy fence, you can look forward to a material that won’t warp, rot, corrode, rust, or break down in any way, meaning you’ll never have to give your fence so much as a paint job to keep it looking new and standing tall. Although vinyl is not quite as versatile as wood, which can be shaped into virtually any design, you’ll still find that we offer vinyl privacy fencing options that will complement any home or business that needs a little more privacy. Chain link fences can be the perfect privacy fencing solution for any home or business, providing the most affordable privacy fencing solution available. Because chain link fences do not provide privacy on their own, we use decorative polyethylene slats to add a tinted layer of protection to your otherwise see-through fence. With these tinted screens, we can match the color of your chain link fence, creating a more private barrier for your home or business that will protect your property, provide a source of shade, and denote property lines. Unlike wooden and vinyl privacy fencing systems, though, a chain link fence with added privacy screens will not help to reduce noise, so if you’re looking for a noise-reducing fencing system, a chain link fence likely isn’t your best option. 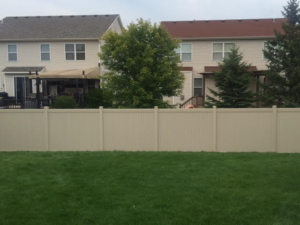 If you’re looking for a privacy fence installation company to help you choose the best privacy fencing system for your home or business, contact Twin Cities Fence at 612-443-1948 or contact@tcfmn.com. We’ll help you understand the advantages of each privacy fencing system, helping you choose between wood, vinyl, and chain link privacy fences to that you make the right choice for you, your property, and your budget.